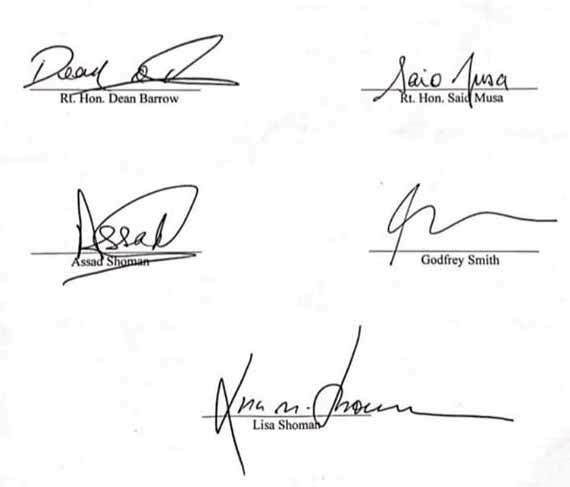 Five Foriegn Affairs Minister signed a declaration today in support of taking the Belize/Guatemala Dispute to the ICJ for final resolution. 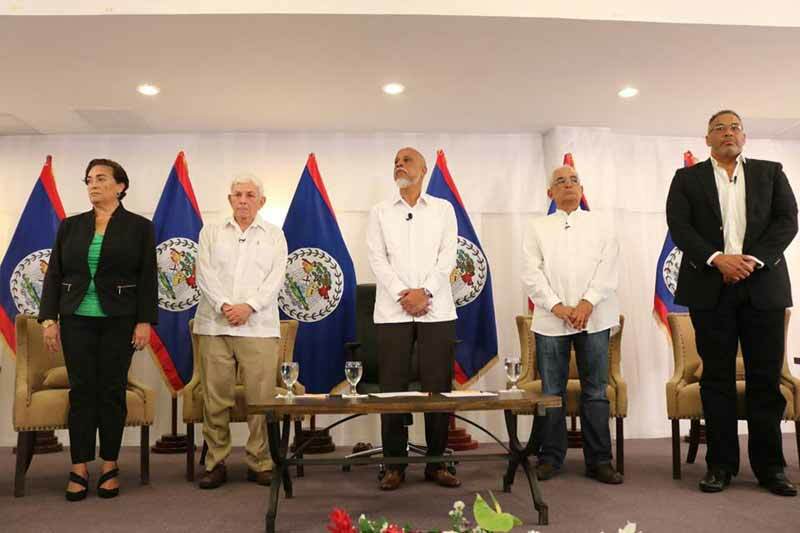 (1) After more than 50 years of arduous negotiations, it has become clear that no Guatemalan Government will ever agree to voluntarily accept Belize's territorial integrity based on the 1859 Treaty. (2) Although Belize's borders are recognised and supported by the international community, the Guatemalan government has responded to that moral mandate with intransigent reaffirmations of its anachronistic claim to Belize's territory. The only certain way to get the Guatemalan government to recognise our legitimate border is through a binding ICJ order. (3) Under the Special Agreement, which was negotiated by Belize with the advice of a team of international legal experts. Guatemala for the first time finally abandoned its position held since 1936 that it would only go to the ICJ if the case were tried on the basis of equity or fairness. The Special Agreement makes clear that the ICJ will only be able to consider the matter on strictly legal grounds and principles, and that Guatemala will not be allowed to make any further claims. (6) Since the ICJ judges will be obliged to look only at the evidence and to apply only the law and established legal principles under Article 38 (1) of the ICJ Statute, as required by the Special Agreement, we are entirely certain that there is no likelihood of Belize losing any territory, whether terrestrial or maritime. In addition, all international lawyers who have fully examined all the evidence on both sides, including several who advised Guatemala. have concluded that Guatemala has no arguable case against Belize. (7) This is the first time in the long history of attempts to resolve the claim that Belize is not being asked to make any compromise. give up anything or give in to any pressure. Going to the ICJ will permit us to obtain a legally enforceable vindication of our rights. It Is for these reasons that we strongly urge a 'yes' vote. It secures for Belize an irreversible and binding decision enshrining forever our right to live in peace within borders that could never again be challenged by anyone. 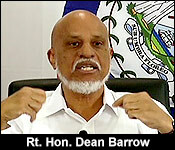 Last night, we told you about the big event that Prime Minister Dean Barrow and the Government of Belize had planned for today. He and 4 other former foreign ministers of Belize, who all served under past PUP Administrations, have decided to publicly declare their support for going to the ICJ. UDP Ministers, high-ranking police officers, personalities from the NGO organizations, and other members of the civil society all waited at the Biltmore Plaza Hotel for Prime Minister Dean Barrow and 4 former PUP Foreign Ministers to make an entrance so that the event could start. 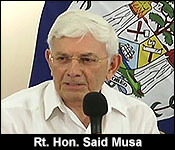 The Prime Minister was the first into the room, and behind him was former Prime Minister Said Musa, closely followed by Assad Shoman, Godfrey Smith, and Lisa Shoman. They all took their seats, and shortly after that, Lisa Shoman was asked to present a joint declaration that all 5 had all agreed to sign. 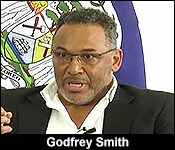 They all think that it is in Belize's best interest to vote "yes" in the ICJ referendum on April 10th. 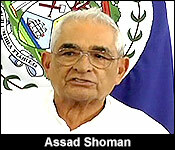 "We, former foreign ministers of foreign affairs of Belize, from 1984 - 2008. 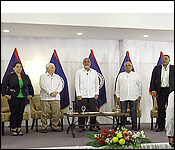 After careful consideration of whether Belize should submit the Guatemalan territorial claim to the International Court of Justice this 9th day of January, 2019 declare the following: 1) after more than 50 years of argues negotiations it has become clear that no Guatemalan government will ever agree to voluntarily accept Belize's territorial integrity based on the 1859 treaty. This is the first time in the long history of attempts to resolve the claim that Belize is not being asked to make any compromise, give up anything, or give in to any pressure. Going to the ICJ will permit us to obtain a legally enforceable vindication of our rights. It is for these reasons that we strongly urge a Yes Vote. It secures for Belize and irreversible and binding decision enshrining forever our right to live in peace within borders that could never again be challenged by anyone." The biggest message that these former Foreign Ministers wanted to send was that the Guatemalan claim to Belize is an existential crisis, which means that it will take a collaborative, and non-partisan effort resolve the claim. "We are here trying to do what we know to be right by our country, this country that all of us loves so very much." "The idea was generated from among the foreign ministers themselves. It's a question of duty, honor and principle and it's as simple as that." "I am here as a former foreign minister first of all. Not as representing any political party. I am a PUP and I will remain a PUP. I want to make that absolutely clear. Among our discussion, the issue came up. Actually has approached me and says wouldn't you be following Dean Barrow or the prime minister by sitting down in the same table with him on this issue. My answer is Prime Minister Dean Barrow is following me, because we were the government before and we were the ones that took the decisions to pursue this path of going to the ICJ." It was certainly an interesting twist today to listen to UDP supporters at this event cheering for former Prime Minister Said Musa, given all the public hate he's received since the end of his Government administration back in 2008. 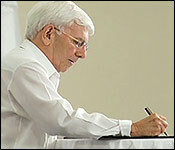 One former PUP Foreign Minister who was not a part of today's joint declaration is Senator Eamon Courtenay. "I see notably absent here is Senator Eamon Courtenay. The question is was an invitation given to him to be a apart of this declaration?" "As the moderator of this session I did ask the 5 former foreign ministers the exact question you asked about the absence of former foreign minister Eamon Courtenay and the very short answer is that he was approached and declined." The rest of the Opposition Party also seems to be leaning towards voting "no" to the ICJ, which makes these prominent PUP's stand out even more. "Some people are advocating that we should wait. Actually, that is a position that I believe my party is about to take, that really we should postponed the decision referendum date from April 10th to a later date. But I am not here today to speak for the PUP. I am here today as former foreign minister." "I do not speak for any political party on any issue and in particular on this issue I have been adamant since the beginning that my position is a position held first and foremost because of how I feel and what I believe to be right for my country. That's number one. I have absolutely no fear about political repercussions, because happily I can tell you at this point that even were I to have political aspirations, which I don't at the moment, what is and always has been most important to me is not to be convenient, but to be right when it comes to my country." And the point that these statesmen and stateswoman want you to take away from today's event is that to the best of their collective knowledge and experience, Belizeans is being offered the best opportunity to be free of Guatemala's territorial claim to our country. "My presence here today signifies and denotes that I believe I have an obligation to step forward as a former foreign minister to say that voting yes to go to the ICJ is the thing to do. I fully appreciate how sensitive and divisive the issue has been. I fully appreciate that visiore fear on the part of a wide swade of the population that there is a chance that we go we lose some maritime or terrestrial territory. 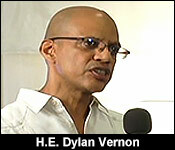 Having considered the matter, having look at the opinions, not only now, but for all the years that I've been intimately involved, I am here and I say so to put the matter on the record, because I am convinced and I believe that there is no realistic chance of Belize losing any territory; land or sea if we go to the ICJ and that we should do so now." As noted in the story, Senator Eamon Courtenay was not among those former foreign Ministers who signed onto this declaration. Our colleagues from the Reporter Press sought him out for comment today, and he is quoted as saying, "This was a publicity stunt. When I go to the circus I go to watch, not to be one of the circus acts. Belizeans are entitled to a properly resourced and balanced education campaign on this critically important issue. Today's event should be seen for what it is: a cheap circus." At today's press conference, the press got a chance to ask Assad Shoman about what he knows about the full contents of Guatemala's territorial Claim to Belize. During these last few months leading up to the referendum, there is still uncertainty as to just how much of the country that Guatemala is claiming. One school of thought is that it is the entire territory that belongs to Belize, while the other is that it is only from the Sibun to the Sarstoon. "There was a problem about getting Guatemala to be precise "What are you claiming?" because obviously it would be nice to know that. They were in a difficult position, because first of all remember that historically they have claimed the entire country. Saying oh we inherited that from Spain, which is rubbish and I could tell you why very quickly. Because for example Spain did not recognized Guatemala at all until 1863. Years after the 1859 treaty. So how could they inherit anything from a country that didn't even recognize it. That was their problem. That was their position - they inherited all hat territory. So how are they going to say with anything less than that? They got into a worse when Belize became independent and the whole world recognize Belize. How you are not going to say that it has any territory. Even worse when Guatemala itself recognized Belize. How can they say that a state has no territory and they have recognized that state? So what did they do? In 1989, they kind of reformulated their claim and they said from the Hondo to the Sibun - Spain had given Britain certain treaty rights to cut wood etc. We can look at that a little differently. We are not withdrawing our claim to that. We are just putting that aside for now. But for the rest of it from the Sibun to the Sarstoon Britain just stole that, so they have to give that back. That was their position." "So that's why a lot of people feel they are claiming from the Sibun down. But no. Remember they did not give up the claim to the rest. So what does a negotiator from Guatemala say in 2008 when you ask him what are you claiming? He can't say the whole of the country, because that would be ridiculous. They recognize Belize. They can't say from the Sibun to the Sarstoon, because then it's violating what its own people have said and what their constitution said. They have not given up the claim to the rest. They still claim it, but they put it to one side. So what can they say? Nothing. They choose to say nothing and they wait to see if the Belizean people agree to go to court, then they have to say what they are claiming. But that's why we couldn't get them to state particularly what the claim is and so we had to do something about that and what we did was we included the words "any and all legal claims" to ensure that they cannot claim something now, like say Sibun to Sarstoon. Lose that and then come back and claim Ambergris Caye or one of the other cayes or something else. That was the trick, that if hadn't put those words in it would have left the door open for them to come back again." 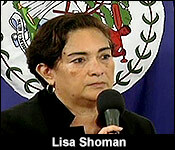 Lisa Shoman was our guest to talk about the recently signed declaration of Former Foreign Ministers. She explained that her position has changed and that she now supports a YES vote to the ICJ.